LNWR Co. Ltd. - Welcome to London and North Western Railway Co. Ltd.
LNWR are Proud to Announce the Companies RIQC Environmental Approval. The London and North Western Railway Co. Ltd. are proud to announce that we have achieved certification to BS EN ISO 14001, Environmental Management System Certification for the management of our operational activities. Passengers welcome refurbished trains on Cambrian Line. 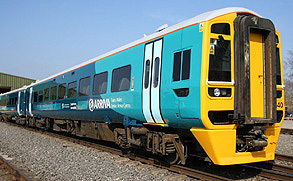 Rail passengers in Wales are benefiting from more comfortable trains following LNWR’s complete overhaul and refurbishment of 24 Arriva Trains Wales’ Class 158 DMU* trains. London & North Western Railway Co. Ltd. (LNWR) is a leading independent UK train maintenance company based in Crewe, with five strategically located depots throughout the country. We provide high quality overhaul, maintenance and servicing of passenger rolling stock, locomotives, freight wagons and track plant. We offer our comprehensive services to Train and Freight Operating Companies, Rolling Stock Leasing Companies (ROSCO's) and Train manufacturers, providing our services throughout the UK, around the clock 365 days a year.